1. In the mid-1990s the catastrophic conflicts in Rwanda and the former Yugoslavia were a major impetus for creating the International Criminal Court (ICC). The ICC was set up by the Rome Statute of 1998 and opened its doors for the first time in July 2002. It now has over 120 member countries and is the world’s only permanent tribunal set up to consider Genocide, War Crimes and Crimes Against Humanity. From 18 July 2018 it will also consider crimes of Aggression. 2. However, states can volunteer (or not) to join the ICC and many big states have NOT signed-up. Shockingly, these include three of the five permanent members of the UN Security Council. At November 2016 the NON-signatories to the ICC include : USA, China, Russia, India, Pakistan, Saudi Arabia, Iraq, Syria, Turkey, Israel, Yemen, Ukraine, Indonesia, Malaysia, North Korea, Myanmar (Burma), Egypt, Rwanda, Libya, Algeria, Zimbabwe, Greenland, Cuba, and many others. Apart from anything else, it is disgraceful that the USA, China and Russia are allowed to dominate the UN Security Council whilst keeping themselves immune from the ICC's international laws and humanitarian standards (more on this below). 3. So, twenty years after its conception, the ICC is still only dealing with a tiny fraction of the world’s law-breakers that it should be holding to account. By mid-2016 the ICC itself had issued just four verdicts. The ICC should by now be a major support for progressive global justice and a deterrent to the many wrongdoers among the world's most powerful (see our List of Bad Leaders here), but it is still struggling. Its no surprise that many of the world's elites, politicians and governments hate the ICC and will do nothing to help its development. 4. Based in the Hague (Netherlands), the ICC can itself investigate and charge suspects but it can also set up joint tribunals with individual countries. It has done this and set up International Criminal Tribunals - in the former Yugoslavia (ICTY) and Rwanda (ICTR), both of which are currently in operation. Also, the ICC can provide expertise to support national courts when they prosecute genocide, war crimes and crimes against humanity. Some countries have laws of ‘Universal Jurisdiction’ which allow (or even oblige) the country to prosecute heinous crimes even if they were committed abroad, by foreigners and against foreigners. While some countries have these laws, few actually use them. 5. The ICC is meant to be a ‘court of last resort’, i.e. it should only be needed if a national court fails to act or for some reason cannot act against a suspect. The ability of individual countries to pursue these major crimes is often limited by weaknesses in their own justice system and laws. Any member nation can ask the ICC to investigate and prosecute a suspect and it can send suspects to the ICC to be dealt with by the Court. Several African countries have done this. 6. In reality, in many countries there is : (a) weak support from the political establishment for international criminal justice standards, (b) little regard for international human rights standards, and (c) little or no willingness to actively pursue such criminals. These are appalling double standards when they exist in small or less developed countries but even worse when they exist in each of the five permanent members of the U.N. Security Council (U.K., China, France, Russia and the U.S.A.). Each of these powerful countries has shown on many occasions that it does not want its own crimes investigated or exposed, or its previous or current politicians (or military or other public figures) called to account. These include (for example) crimes in war and conflict as well as crimes in politics, economics and business. suspects. Many people would like the ICC to focus on those leaders who decided that war should take place, but the ICC says it does not have jurisdiction over that decision (many of us think it should have). The U.S.A. President George Bush and the U.K. Prime Minister Tony Blair were the key figures in that decision – the U.N Secretary General at the time warned them it would be an illegal war. 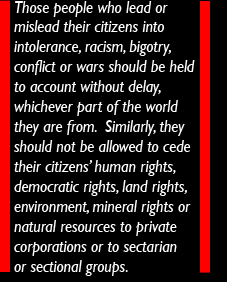 Bush and Blair (and many others in their administrations) lied to the U.N., to their publics, to other nations and to the world’s press and media. Many claims were made about carrying out 'nation-building' to improve Iraq's future. However, Bush and Blair's motives were bound up with sustaining their own geopolitical power and ensuring their control over Iraq’s oil reserves. 8. After several years of carnage, the U.S.A. supposedly withdrew from Iraq in 2011 and then became re-involved in 2014 at the head of a new coalition. So far, at least several hundred thousand civilians have been killed and millions have been injured. Thousands of military personnel have also been killed. Over this whole period many Iraqis believe their country has been left in its worst condition since the Mongol invasion of 1258. Every Iraqi citizen has lived a life turned upside down - at best. This conflict has so far lasted over twice as long as the second world war and has evolved through several stages of multi-dimensional conflict. It continues to this day. 9. There have also been linkages between the conflict in Iraq and the other multi-dimensional conflict next door in Syria. This is the largest humanitarian disaster since the second world war and it has so far created several million Refugees. Unfortunately, there are no signs that peace will break out in Syria soon. And there are few signs that the biggest criminals – those nations who are feeding and conducting this war – will face justice soon. 10. Numerous international bodies have observed that the Syrian and Russian governments (and various other parties to the conflict) have committed war crimes, but will the ICC ever prosecute the suspects ? Even if it one day does, there is no sign that it will prosecute the corporations who are arms manufacturers and arms dealers, or the states who organise shady arms deals and military aid deals which have supplied arms to all the parties in the Syrian conflict. The USA, the UK, and Russia are the key countries in this – all permanent members of the UN Security Council. In the Autumn of 2016 Russian/Syrian warplanes even bombed a United Nations Humanitarian Convoy during the UN-brokered ceasefire', killing numerous aid workers and civilians. It did this at the very same time that the United Nations was holding its annual General Assembly of world leaders in New York. Yet, there was a staggering lack of action from the UN, to the extent that this was a massive indictment of the supposed 'world order' and 'world powers'. Rarely has the UN failed so abysmally to show leadership - it failed the whole of humanity by not calling Russia and Syria to account. There are many more situations that require international legal action but nothing has been done. For example, the USA, Britain and others have given massive military aid and weapons to Israel which it has used to attack, oppress and repress the Palestinian people over seven decades. Saudi Arabia has, for several years, been using weapons and military equipment supplied by the USA and Britain to kill thousands of people in Yemen, in a war that is barely ever mentioned in the western media. The ICC seems a very long way from carrying out investigations into these conflicts or charging anyone (e.g. governments, politicians, corporations, military officers, etc) with any crime. systems and courts are often ineffective at bringing powerful figures in their own countries to justice or in sending them to the ICC to be dealt with. In many countries there are bad leaders, politicians and political parties who denigrate international laws, human rights standards and the ICC, and their governments often vote to limit the ICC’s budget and resources. Too many of them are actively promoting a weak political climate on human rights and international justice. 12. However, the ICC does potentially have considerable powers. Its prosecutor can open investigations on the territory of any of its (over 120) member countries and investigate the nationals of these countries. Perhaps if the ICC ever gets the support, the budget and the resources it needs it will eventually investigate and prosecute some of the world’s most powerful leaders and governments. Now, in 2018, that seems a very big ‘If’. 13. In Rwanda in 100 days during 1994 there was a genocidal mass slaughter of up to a million Tutsi people carried out by the Hutu-led government and its supporters. Possibly as many as 20% of Rwanda’s population were killed. In addition, an estimated two million Rwandans were displaced and became Refugees. Throughout this genocide the United Nations stood by and did nothing to stop this mass slaughter at any stage. for crimes committed in their own countries. In response, those leaders and their various allies whipped up opposition to the ICC. They exploited the fact that until 2016 all ICC investigations had been in Africa. They ignored the fact that the majority of the suspects had been sent to the ICC by African governments. 16. As the work of the ICC spreads to other parts of the world it will face pressures and attacks from political interests opposed to accountability. As an example, the USA’s refusal to prosecute torture carried out by its Central Intelligence Agency (CIA) shows the USA’s entrenched double standards. This contrasts with the globally consistent application of justice that the ICC exists to implement. It is potentially the global court which will hold even the most powerful to account. 17. Those leaders who lead or mislead their citizens into intolerance, racism, bigotry, conflict or wars should be held to account without delay, whichever part of the world they are from. Similarly, they should not be allowed to cede their citizens’ human rights, democratic rights, land rights, environment, mineral rights or natural resources to private corporations or to sectarian or sectional groups. 18. International justice should be available to all, not just to the rich and powerful, and should be applied consistently across all the nations of the world. International law should apply to all political leaders as well as to non-politicians (e.g. corporations) of all nations, and of all political persuasions. 19. We would not dream of getting on a plane, train or bus with unqualified, untrained and unchecked pilots or drivers - so why should we tolerate unqualified, untrained and unchecked politicians and leaders ? They should all be much more closely accountable to the world’s citizens, including through international laws and standards of justice and human rights – with no exceptions.